THIS Wednesday (March 11), Bank Negara Malaysia (BNM) will release its 2014 annual report and many will be looking out for more clues on whether they should turn contrarian and bet that Malaysia will cut interest rates in the coming months to spur growth. 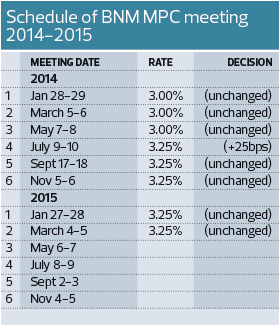 The central bank kept the key policy rate at 3.25%, as widely predicted last Thursday. Currently, the consensus is still largely for interest rates to stand pat for most of this year with at least five economists predicting a 25 basis point hike towards the third quarter, possibly after the US Federal Reserve begins normalising its policy rates. “We still opine that an OPR (overnight policy rate) cut is off the table despite the recent monetary easing trend (seen in India, Indonesia, Australia and Singapore). GDP growth at 4.5% to 5.5% and absence of deflation threat do not warrant a rate cut,” Hong Leong Investment Bank Research economist Sia Ket Ee wrote in a March 6 note. “A rate cut will also narrow the Malaysia-US interest rate differential, causing the ringgit to be more fragile,” he adds. But Morgan Stanley and JP Morgan have a contrarian view. Both reckon that Malaysia could cut interest rates as early as 2Q2015, according to Bloomberg data. JP Morgan, which expects a 25 bps cut post-GST implementation, in a recent note said policy focus for 2015 “will be biased towards maintaining growth amid tightening conditions, the introduction of the 6% goods and services tax (GST) in April and declining consumer sentiment”. Morgan Stanley, in fact, had expected a 25 bps cut to happen within the current quarter and a second 25 bps cut by the second quarter to 2.75%. Inflation hit a five year low in January of only 1%, elevating real interest rates into positive territory — giving the central bank more policy flexibility. 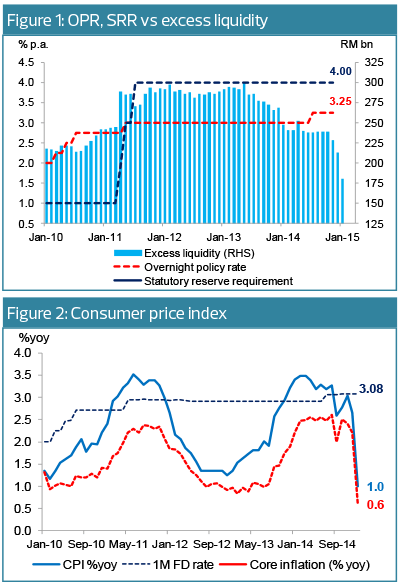 “BNM’s current policy stance is circled around its expectation of ‘steady growth’ in the domestic economy. If BNM’s assessment on domestic growth turns more negative going forward given the fiscal and investment shock from falling oil prices, there is some small probability that BNM may choose to cut rates, even if this could pressure the ringgit lower,” Chua says, adding that monetary policy direction would very much be dependent on macro data releases in the coming months. BNM’s Monetary Policy Committee’s (MPC) next scheduled policy statement is on May 7 — about a month after the implementation of GST on April 1 — but ahead of the release of 1Q2015 GDP on May 14 and Consumer Price Index (CPI) for April on May 20. After that, BNM’s MPC is scheduled to meet three more times this year on July 9, Sept 3 and Nov 5. That said, BNM has the flexibility to make unscheduled policy announcements, should it deem it necessary. When comparing last Thursday’s BNM statement to the previous one issued on Jan 28, economists at Citi Investment Research pointed out to clients that the central bank dropped the word “appropriate” in its latest statement while maintaining that its monetary policy was still “accommodative”. “We suspect the statement was designed to be ambiguous, giving the MPC (monetary policy committee) maximum flexibility and moderating rate expectations on both sides. While some could place greater weight on below average inflation and interpret the absence of ‘appropriate’ language as dovish, the positive assessment on growth suggest no immediate need to cut rates,” Citi’s economists Kit Wei Zheng and Yap Kim Leng wrote in a March 5 note, adding that they “place greater weight on assessment that policy is accommodative and supportive of economic activity”. The latter suggests that the next move is skewed towards a hike, “perhaps as an attempt to support the ringgit”. The ringgit skidded to a six-year low of RM3.6628 to a US dollar ahead of BNM’s decision last Thursday before recovering to 3.6487 at closing. It was still the worst performing among Bloomberg’s selection of 12 Asian currencies, having skidded 12.78% versus the greenback in the past six months. Year-to-date, the ringgit is at second last place with a 4.15% decline as at March 5, just ahead of the 4.63% decline for the Indonesian rupiah, Bloomberg data showed. “Oil price movements and developments over 1MDB will be critical in determining the ringgit’s performance going forward,” an economist says. While a weaker ringgit would make foreign-denominated debt more costly, BaML’s Chua, for one, reckons that the central bank would choose to support growth even if the move could cause the ringgit to slide. The Citi economists too maintain they view that BNM will likely keep rates unchanged in 2015 “barring significant changes in the growth outlook”. Will BNM have reason to change its assessment of growth? Malaysia’s official GDP projection was revised to 4.5% to 5.5% in January, slower than the 6% at which the economy expanded in 2014. When releasing 4Q GDP on Feb 12, the BNM governor said Malaysia is still on a “steady growth path” and that there remains ample liquidity in the domestic financial system and no disruption to financial intermediation. This was repeated in its latest statement last Wednesday. “Investment activity is also expected to remain resilient, with broad-based capital spending by both the private and public sectors, thus cushioning the lower investment in the oil and gas sector,” BNM said in its March 5 statement. BNM traditionally also provides its forecast and view on the economy in its annual report. In a recent interview, BaML’s Chua said a weaker ringgit “may be one of the few [policy] options to support exports and growth” and that the Malaysian government should also focus on reviving foreign direct investment and tourism to help support growth. Any boost would be a welcome respite for Malaysia. As it is, Malaysia’s approved investments are expected to moderate this year — after four straight years of record growth — on softer sentiments in the oil and gas, as well as real estate sectors.